In the 1990's the Burswood Dome was transformed into a in-door speedway venue for some special event, Racing initially consisted of Solos, Sidecars and Formular 500's, we are unsure of how many meeting were held at the Superdome. 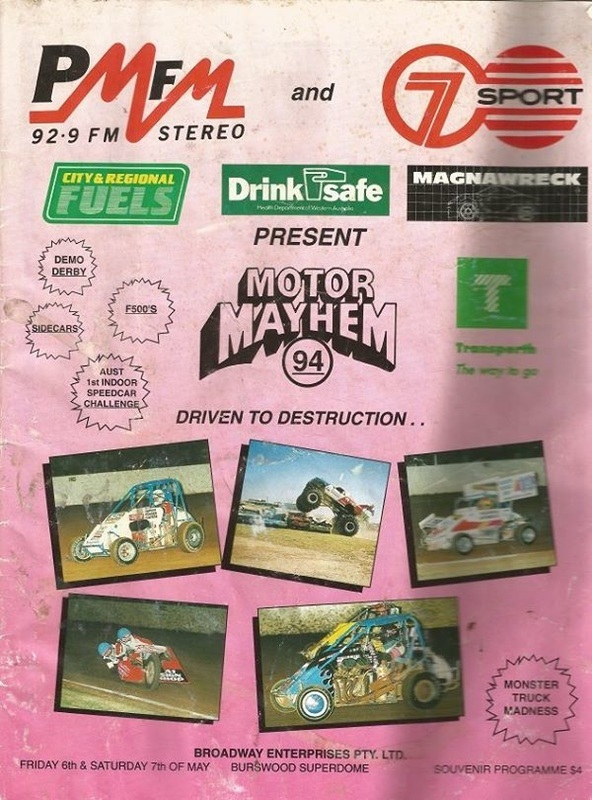 On the 6th and 7th of May 1994 the biggest ever indoor promotion of speedway seen in WA was staged at the Superdome, Motor Mayham saw a programme of Speedcars, Formular 500's and Sidecars, 20 events were programed for each night finishing with a 30 car $5000.00 to win Demo Derby, Speedcars contested a 50 lap feature on the 260 metre circuit, with Monster Trucks also making an appearance. Several top names appeared in the Speedcar nominations including Max Dumesny, Steven Graham, Mark Brown, the eventual winner Keith Giles and the Bunbury Bullet Ron Krikke in his first ever speedcar ride, Ron would end up upside down on the night.